Read a Dawna Shepherd Short Story Online for Free! “Texas Two-Step,” was a finalist for the 2004 Macavity Award for Best Mystery Short Story. 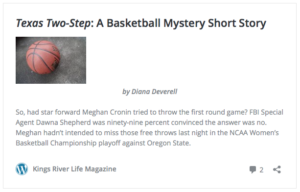 In honor of March Madness, the national collegiate basketball championships, you can read it online for free in this week’s issue of Kings River Life Magazine. Follow this link and enjoy a good read!